New Pig takes the transport and storage of drums seriously. 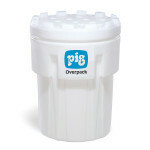 Damaged drums and containers can be easily shipped using PIG® Overpack Drums. Overpacks are made of lightweight, 100% polyethylene and are chemical resistant. 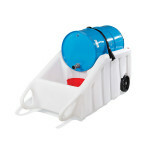 Do-it-all Mobile Dispensing Dolly transports, dispenses and contains.